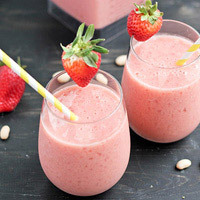 The ultimate smoothie—fiber-rich beans are blended with sweet strawberries and tangy pineapple juice. In a blender or food processor, process all ingredients, except ice cubes. Add ice cubes and blend until smooth. Serve in glasses.